Conventional wisdom lists four things to avoid doing at all costs. You never (1) tug on Superman’s cape, (2) you don’t spit into the wind, (3) you don’t pull the mask of that old Lone Ranger, (4) and you don’t mess around with Jim. Jim Croce’s 1972 lyrics laid out the rules fairly clearly; it’s a shame his register is so inaccurate. Tug on Superman’s cape? Why not? The Man of Steel is a good-natured fellow. Give his cape an innocent yank, and you might get a free ride around Metropolis and some politely dispensed life tips mid-flight. Spit into the wind? It should advise: “Don’t spit into the wind if you’re a complete nitwit who doesn’t understand how wind works.” Spit up. Spit left. Spit right. Spit any direction toward the wind except straight forward. Pull the mask off the Lone Ranger? A good recommendation for folks living in America’s Old West, but none too practical for those outside the jurisdiction of Texas Rangers. Mess around with Jim? Jim Brown? Jimmy Stewart? Jim Henson? Jimmy Carter? Over the years, I’ve crossed paths with many Jims, and, by and large, they’re good-humored people who don’t mind a little messing. The Songshan District of Taipei is nestled alongside the aptly named Songshan Airport, a smaller and more localized hub compared with the Taiwan Taoyuan International Airport only 25 miles away. The district, which operated for generations as tea fields and then, later, as housing districts for military and government families,is one of the greenest areas of modern Taipei City. Tree-lined medians cast comforting shadows over the uncharacteristicallywide streets. Teahouses with outdoor seating are tucked among shrubbery that otherwise feels out of place contrasted against concrete walls lining most other parts of the city. As a result, the downtown Songshan District feels more akin to the outskirt county areas with lower rents, more traditional housing, fresher air and reliance on Taiwan’s beautiful landscapes. It just happens that the Songshan District is smack dab in the middle of the city, alongside Taipei Arena and IKEA and a short jaunt from the likes of Costco and a Harley-Davidson dealership. 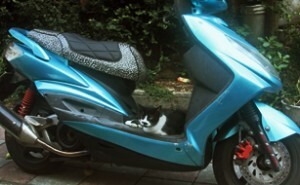 For a time while living in Taipei, Amy and I resided in the Songshan District, among the trees, beneath the shade, adjacent to the roaring airplanes, amid the teahouses, near the shopping mega complexes, … and alongside the stray cats. The overwhelming number of stray cats. People aren’t the only ones drawn to Songshan’s parks and urban forestry. The oases of greenery attracted a feline mob. They hid behind cars’ tires and stretched out on the windshields. They rested on tree branches. They curled up on park benches and building stoops. They wrapped themselves around potted plants, and buried themselves beneath piles of fallen leaves. They lounged on awnings. They perched on walls. They occupied scooter seats and overturned umbrellas, and took up residence wherever they needed a nap. They strutted and pranced, hissed and purred, sauntered across streets and pounced along the schools’ playgrounds. They came in all shapes, colors and sizes, too. There was the obese orange cat we called Garfield. There was the black one whose white paws earned it the nickname Snowshoes. Brown ones, white ones, gray ones, small ones, long ones, ones with short tails, some with no tails, a few floppy eared Scottish Folds and a number of cats that looked eerily similar to the one Amy and I left Stateside when we moved to Taiwan years before. One thing the feline horde members had in common was that they all appeared remarkably well-nourished. No mange. No hairballs blowing across the streets like tumbleweeds. No random piles of vomit on the sidewalks. No decaying teeth or wonky limbs. No limps or missing eyes. Their fur glistened in the sun. Their voices echoed through the alleys with authority. Their dispositions seemed pleasant. They appeared … healthy. That shouldn’t be the case for homeless animals. 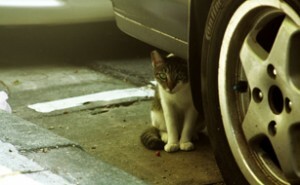 Stray cats are strays for a reason, and kitties wind up in the wild one of two ways. Either a previous owner had deemed them too unfit to domesticate and released them onto the street, or they were born in the gutter and haven’t received the necessary vaccinations and care. Thus, being malnourished and unhealthy is either the cause or the result of living on the streets. 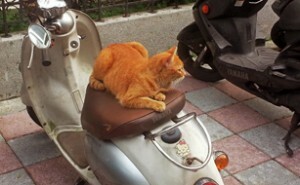 Neither scenario bodes well for the long-term prognosis of street cats. It’s something that our friends, Maurice and Robyn, know all too well. The couple’s hearts bleed for homeless animals so dramatically that it’s amazing any blood is left to pump through their veins. First, the pair adopted Oliver, a temperamental, alley-dweller prone to slashing at unsuspectinghouseguests and with a fondness for urinating on bedroom pillows. Next came Muji and Kiara, sibling kittens separated only after a tumor on one’s liver became too much to survive. Their fourth adoption was Meiko, a rescue animal that Maurice and Robyn agreed to take in. Fifth was Gracie, which a dog attack had left blind and suffering from seizure-inducing brain damage. Their sixth cat was Naartjei, which had fallen through a ceiling and needed to be cut from within the walls of a nearby school. In June 2013, my uneasiness toward random felines reached its apex. The World Organization for Animal Health had classified Taiwan as “rabies-free” for 52 years. Yet, when the disease was detected in a trio of ferret-badgers, the island lost its international status. Since the disease was diagnosed in Taiwan’s rural countryside, health organizations speculated a rapid spread of cases, as opposed to if the cases had been found in a controlled, domestic setting. The new existence of rabies, coupled with cats’ change-without-a-moment’s-notice moods, meant I kept a safe distance from the Songshan cats. Historically, the best case for an alley cat is Hanna-Barbera’s “Top Cat” cartoon, a cunning pack leader out to make a quick dollar and keep out of the law’s reach. Loyal. Suave. He never bothered anyone who didn’t deserve it, and he was happier unseen and unheard by the powers that be. Yet, more than likely, the streetwise militia had more in common with Marvel Comic’s unwieldy villain Sabertooth. I often strolled down the middle of the streets, staying out of paws’ reach of the feline snipers hidden at eye and ankle levels. Herding cats might be impossible. But that didn’t mean the ones in my neighborhood wouldn’t organize a unified assault on unsuspecting intruders. There isn’t a great genetic leap between the Songshan cats and the prides roaming Africa’s savannas. Beneath the surface, what I feared was that they all were angry, all aggressive, all full of angst. But on the surface, what I knew was that they all looked pristine. 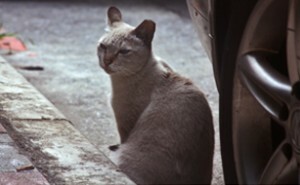 Their day-to-day lives on the street offered no explanation for how the Songshan District kept its feline residents looking so well-kempt. Was it the shade? Was it the tea leaves? What about this neighborhood prevented animals that lived under vehicles and in crawlspaces from looking like anything of the sort? The answer unfolded one weeknight when Amy and I popped into 7-Eleven for a snack. We quickly split up, grabbed our respective items and reconvened at the counter to pay. Mixed in with the milk, chewing gum and potato chips was a tin of cat food. Confused, I shot Amy a look of bewilderment. Before I had time to protest – it was dangerous, unsanitary, she was enabling their freeloading ways and bolstering their sense of entitlement – the cashier had scanned and bagged the goods. By the time we stepped out of the store, she had launched into her opening statement. It is as though she’d read my thoughts to tick concerns off one by one. The only thing that could make this worse was for the neighbors to catch a glimpse of Amy leading a pack of cats down the street and dishing out canned tuna like a feline food bank. The last thing we needed was to be blamed for the area’s cat infestation. She smirked, very pleased with herself, and turned toward home while popping open a can of “Turkey & Giblets” mush. I had yet to say a word. The next afternoon, I ventured through the neighborhood’s alleys. Still dumbfounded and uneasy that my wife could be – in part – to blame for why the district was overrun by a furry rabble. As I walked down an unmarked lane, a beige cat sprinted beside me, then zoomed past without breaking stride. A few steps later, I was overtaken by a black tabby. Then Garfield whizzed by. Then another. Then two more. I had unsuspectingly wandered into a cat marathon, with the neighborhood horde bounding down the street to or – gasp – from something. 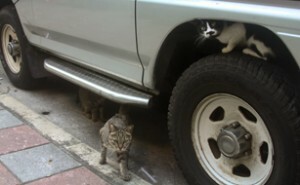 In a matter of seconds, I’d been swarmed and left in the dust by dozens of cats. Yet, I was too far into the alley to bother turning back. I soldiered onward. When I came to the intersection at the end, an elderly woman stood smiling with a soup ladle in hand. We made eye contact, and she nodded slightly. Her red apron was smeared with dark brown flakes; her weathered sandals were smudged with dirt and plastered with a few random clumps of fur. At her feet was a small garbage bin. In her other hand was a feather duster. I turned the corner and stopped in my tracks. The army of cats that had zipped past me moments earlier was huddled in small pods along the sidewalk. 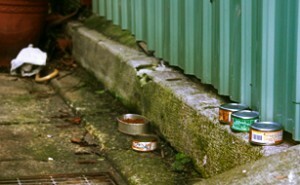 Groups of two or three cats barreled down on large piles of food that had been dished out strategically along the pavement. For an explanation, I turned toward the woman. Upon further investigation, the bin at her feet was full of dried cat food, the ladle in her hand contained the next hearty scoop. She still was smiling contently, but not at me. Her grin was for her minions, which intently chowed down on the day’s offering. 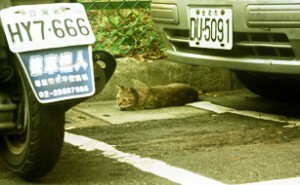 If the parks were what brought the cats to the Songshan District, this woman kept them there. All the shade and teahouses, trees and spacious living were no match for free food. The cats just didn’t act like neighborhood royalty; they were treated as such. Fed. Pampered. Feather dusted? I retreated slowly, but nodded at her as I turned the corner back home. I don’t trifle with stray cats.